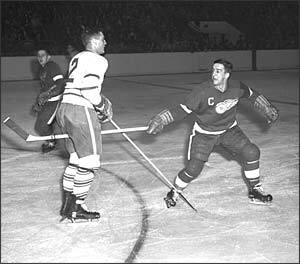 Ted Lindsay left an immense hockey legacy when he retired from the Detroit Red Wings following the 1964-65 season. Besides contributing to four Stanley Cup championships, Ted won the Art Ross as scoring champion in 1949-50 and was selected to an NHL All-Star team on nine occasions. But his enduring legacy may very well have slid under the radar. Ted initiated the first National Hockey League Players' Association. "Mr. Campbell (NHL president) always talked about how we had the greatest pension in the world. He was a Rhodes Scholar and I hear how brilliant Rhodes Scholars are, but if he is an example of a Rhodes Scholar, I don't think they're too brilliant! He always came into our room, and all the other teams' rooms, too, and told us what a great pension we had and told us we were not to fraternize with members of the opposite teams." "We never spoke to each other when we traveled," Lindsay begins. "We travelled by train. You never spoke to the other team. For example, if we were in Toronto, I might be walking down College Street (near the old Maple Leaf Gardens), walking from Yonge Street down to the Gardens, if a Toronto player came out of the building and if he saw me or I saw him, one of us would cross the street so we didn't have to acknowledge each other. That was a wonderful feeling we had and that's the right way to play hockey. That was our attitude." "One of the major differences was that we never had agents back at that time. It was a dictatorship during the six-team league. That's what it was. They'd say, 'Jump,' and you'd say, 'How high and how many times?' You just reacted that way. You would agree to a contract but you couldn't even take that contract out of the manager's office. They would say, 'It's against the by-laws.' Every player in that six-team league, all he wanted to do was play hockey. That was our livelihood - we never argued the point. They gave us our contracts. They said, 'Take it, that's all you're going to get.' So I just wanted to get a voice as a team." "I talked to Bob Feller. Bob was head of the American League Baseball Players' Association and they had a great association. I'm not Einstein by any means, but I'm also not stupid. I wanted to show the owners that we wanted to negotiate something but we weren't demanding to run the league. We just wanted to have a voice." "Now the owners meet three or four times a year. We never met. Once the season was over, we disbanded at that time and 99% of the players were Canadians and were spread out across Canada and you wouldn't see your teammates until the next September in training camp. I wanted to be able to get a voice so we could sit down. After talking with Bob (Feller), he put me in touch with lawyers in New York. The laws were way different back then. If the laws we have today would have been in place back then, all the owners and managers would have been in jail. It was like slavery back then. We were playing the game we loved. But to form a players' association when you didn't speak to each other, that becomes very difficult." 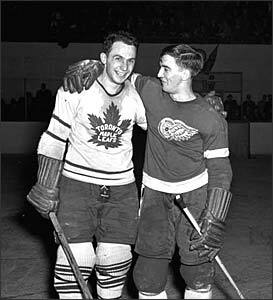 Montreal legend Doug Harvey played a key role in strumming up support with Lindsay to initiate the first National Hockey League Players' Association. Lindsay was respected but disliked as a competitor throughout the league. For 'Terrible Ted' to pull together enough competitors to form a players' association was going to be extremely difficult. "The All-Star Game was always played before the season started. The Stanley Cup winner played against the All-Stars. 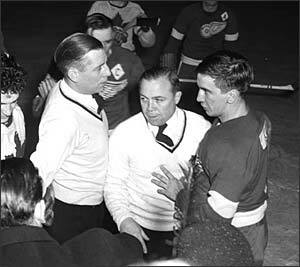 That year (1955) the All-Star Game was going to be in Detroit because we won the Stanley Cup. 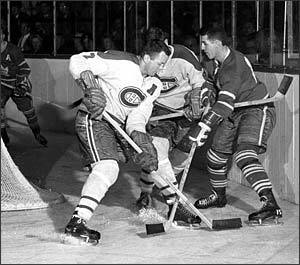 Doug Harvey (of the Montreal Canadiens) was one of the more intelligent guys in the National Hockey League. Doug was a strong force. I don't know how it worked out but I got to Doug and told him what I had in mind and with the top players all coming into Detroit, we wanted to be able to sit down quietly - this was not to be publicized; nobody was to know we were doing this. We did it and it worked out. You had to put $100 in because we had to pay the lawyers. To get $100 out of the players back in those days was tough. We were only making $5,500 to $7500 (per year) and guys in the minor leagues were making $3500 to $4000." "We had the meeting and everybody joined but one and that was Ted Kennedy. He didn't believe in it, which was fine. We hated each other when we played Toronto. That had nothing to do with the fact he was a talented hockey player. He didn't believe in it? Fine. No one condemned him for that. I also believe very strongly that that cost him a lifetime job with the Toronto Maple Leafs. Mr. Smythe believed in loyalty. He had just returned from the services and he believed in loyalty to country and your team. When Mr. Smythe found out about the association and found out that Ted Kennedy had not informed him that we had formed the association, Mr. Smythe figured that he was disloyal. In fact, that was so far from the truth. I feel very strongly that that cost Ted Kennedy a lifetime job with the Leafs. " adversaries on the ice, but partners off the ice in the battle for player rights. Both were dealt to the cellar-dwelling Chicago Blackhawks, martyred for their intentions to rally players to combat the owner's dictatorial style of running the league. Ted continues, "This was October. There never were any games played on Monday, Tuesday or Friday. Those were travel days. We had the press conference on Monday night in New York City. All the player representatives flew in and we had the press conference and that's the first the owners knew anything about it. And believe me, this was a miracle because the trainers in the dressing room at that time were the telephone to the general manager's and the coach's room upstairs. They never got wind of it and I think that hurt them, that we could keep a secret like that." "All the guys went back to their rinks and I went back to Detroit the next day. I knew darn well when I got to the Olympia (the home arena of the Red Wings at that time), they weren't getting dressed for practice because there was going to be a war in there. Sure enough, Adams was steaming around in the dressing room. It looked like somebody painted him with a red paint brush because his blood pressure was so up so much. He started to condemn it all." "The guys were all from small towns and they had interpretations of what the word 'union' meant. They didn't like the word 'union.' The lawyers kept saying, 'Fellas, you're going to have to have a union.' I kept saying, 'We can do it with an association. The guys don't want a union.'" "Pressure was put on to break us for forming this association," Lindsay explains. "The threats got greater. Finally, I got traded to Chicago with Glenn Hall and so was Jimmy Thomson from Toronto. Then, as more pressure was added, the guys started to realize that we had to have a union. We were an international sport so we had to certify in Canada and we had to certify in the United States." "We picked Toronto as the place to certify in Canada. We picked Detroit in the U.S. I was in Chicago at the time. If I had known that Detroit was going to turn out like that, I would have done it in Chicago. The situation in Detroit was what hung us." When a couple of the Red Wing players broke rank and decided not to continue supporting a National Hockey League Players' Association, the dissension formed a crack and proved to be the ultimate demise of Ted Lindsay's best laid plans. Lindsay and Maple Leaf representative Jimmy Thomson were dispatched to the cellar dwelling Chicago Blackhawks - both martyred for their intentions. Although the Players' Association did not fly at that point, by 1967, it took hold and stuck, forming a unified collection of players that has served its membership very well through the past thirty-seven years. The National Hockey League Players' Association of today was built upon a foundation first laid by Ted Lindsay. Kevin Shea is the Manager of Special Projects and Publishing at the Hockey Hall of Fame.